A bit more than a third of our balcony..
...is visible in the photo. 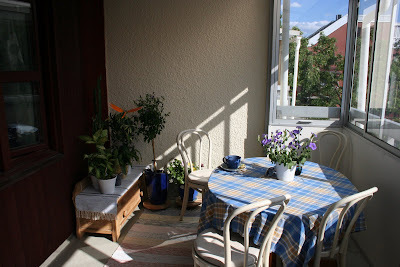 I am proud of my creation - it is transformed from storage area to a supernice place to spend time! For the window cleaner at Kista Galleria this morning: I am sorry that I ignored you when you first said, bright and happy, "Good morning!" and when this got no response, a compassionate-sounding "Tired?". You were perfectly friendly, but you were only too right - I was so tired I couldn't make my vocal chords work, far less come up with a proper response to something so friendly that early in the morning on what was supposed to be my day off (the person that was supposed to work this morning called and said she's not coming yesterday afternoon). But you on the other hand, were probably up way before me, considering you had worked your way through almost half the windows inside the mall already - yet you managed to be friendly to a grumpy person wandering through at 0730 in the morning. I am impressed. And I'll try to be friendly back next time. Or "Find five errors". But it sounds much nicer in Swedish! I don't think there are five, but something is striking me as increasingly funny. In a not-so-amusing way. My boyfriend doesn't read my blog. Which would be totally perfectly ok by me if he had a reason like simply that he doesn't want to. But instead he explains that there is no time for it, he has too much to do, too many things to read. Then he proceeded to - the same evening - spend five hours in front of the television, mostly (if not all the time) watching various soaps and other series, sometimes lifting his hands to say something in irc. Uhm. Any thoughts on this, dear readers? I set out to make a list of recently read books, but already by the second book I went off-track. I decided to make a separate post out of it, with some of my thoughts and experiences about death and more particularly the loss related to someone dying. Basically, a little peek inside my thoughts. I haven't attempted to structure this too much, but to write it down more or less in the order I thought it. I often have these internal monologues, I lead conversations with myself, or just a running monologue of thoughts, as if I were explaining everything I see to someone. It makes it harder to recall, actually, since my ability of remembering everything is linked to my ability of remembering images and sensations. Mixing words into it destroy that. But I digress. Here are some of my thoughts, pretty much uncensored from what I thought earlier today (the trick is to run for a pad of paper and start writing when I begin a monologue, to get it all down. That way I catch most of it. Cool, huh?). People around me have died, of course. Relatives, people at school, et cetera. For a while there was a higher than what the law of average decrees number of accidents, overdoses, suicides and murders in the area I grew up. Since the place is too small to even be called a town, you pretty much know who everyone are. But none of these deaths (acquintances, relatives) really touched me. Most of them I just observed without any emotion at all. When my aunt died, I stated that I was happy she no longer had to suffer (she had some pretty bad cancer). When my father died, I actually displayed some sort of emotion - relief. I know alot of you might feel shocked by this, but the only feeling I had when I heard he was dead was relief. My flatmate, Beledra, said my smile went around my head. There was relief that he was gone. No more fear. He'd never hurt me again. Of course, that is not strictly true. The paranoia he baked into me sits deep, and on the worst days I even doubt that he is dead - that it is all a ploy to make me relax so he can track me down. But it is getting better. He will NOT track me down. I have even dared take up the lost contact with my family, my siblings. I have loved them from a distance all these years out of fear, unrelated to them. I hope they will forgive me. But I am slowly taking control of my life and it is getting easier. The bottom line is, I didn't feel loss at any of these deaths. On the other hand, I have often felt - and still feel - a deep grief that I never got to know my half-brother. I never met him at all. What would it have been like to have him around? Lots and lots of what-ifs. I am good at those. I also harbour a deep panicky fear that my maternal grandpa will die. And he will, we all will, but considering the difference in our age it is doubtful that he will survive me. And that loss I am not totally sure how to deal with. I solved the problem in my usual fashion, distancing myself already now. Regression. I already lost the fight so I give up before the fact. Healthy? Probably not. I generally seem to have a hard time connecting to people. Be it friends or relatives or colleagues. Perhaps my own fear of being hurt makes me seem so distanced that I turn others away. The fact that I don't know what to say or how to behave in social situations hardly help. The end result being that I feel lonely and left out, blaming them. But, there are two sides to every situation, I realise this. Both sides could do better, that includes me. Another digression. Back on track. One of the first people I have deeply connected with was Berta the Cat, we were best friends from the start. For over thirteen years she was my best friend, my partner-in-crime, the one I could confide everything to, and that talked back at me without any accusations, hard words or rejections. So when she died around 14 months ago, I was devastated. And she lived five years longer than the most optimistic bet the veterinarian made back in 2000, so I should have seen it coming for a long time. But I did not. In all my fantasies about the future, she was always there. I still feel more than slightly helpless when I turn around and realise she isn't there. But at least I have stopped hearing and seeing her everywhere. The last time I saw here was when the nurse carried her away in a cage to be cremated (and what happened before that was a story in itself, no silent going to sleep by a vets hand there - she screamed in pain at the shots. Was he injecting acid, or what? I have never felt so full of hate towards myself, even now I start weeping at the memory). I have been having nightmares where I found her, finally, and she had been trapped in a cage and in pain all these months, and she blamed me for putting her there and not coming for her, not being there to comfort her. After waking from a such dream I would be breaking out in tears for days, standing in supermarket lines, at work, everywhere, collapsing into bed as soon as I got home, crying myself to sleep from pure exhaustion. In a book I read this week, Anybody Out There, it was quoted that it takes a year and a day to come to terms with the loss, to really realise that they are gone. I think this is mostly true, it takes a bit over a year at least. Not too long ago, might have been a month or six weeks or even two months, Berta again appeared in my dream, but this time I thought "But you are dead. You cannot be here." It seems the horrible truth had finally sunk in. Around the same time, I emotionally adopted a new cat, Jonathan, that is as soon as is convenient coming to live with me and be my new best friend. Then I guess I will go through all of this again in ten or fifteen years. But it is worth it to dispell the loneliness, to have a friend that truly accept me and will be there no matter what. I am emotionally ready to open up for a new friend. The book was about the loss of a husband and friend, but it seems the only thing I can relate to is the loss of a cat. However, I do not doubt that we can feel as strongly or stronger about our four-legged friends, and that the sorrow at their passing is felt as acutely. Am I not proof? Thus I wound up sortof appreciating the book after all, though it by no means fit my usual choice of happy endings books where as little scary or bad happens as possible. The point to this rant? None I suppose, apart from my need to get this off my heart. I read alot, as you might know. And I prefer buying my books, though sometimes I will borrow from friends. I used to adore the public libraries too, but the entire situation with me not having an ID card stops me from using those facilities (unless I want to sit there reading). Recently I have read a mixture of old and new books - to make the new last longer I read every second or third book from my collection of oldies - most recently I have been chewing through my Agatha Christie collection. Haruki Murakami - Dance Dance Dance: I am two thirds into it. Good stuff. Apart from the names, this could be anywhere - USA, Norway, Switzerland or, as it is, Japan. So don't be prejudiced. I think I will read more from this author, the humour combined with a worldview I recognize, with an added dash of the supernatural (warps in time and space, among other things), it is perfectly captivating. Marian Keyes - Anybody Out There: Slightly painful, slightly funny, slightly comforting. It set off a whole little rant on my part, about death and loss. Mercedes Lackey - One Good Knight: I love this. A parody upon all fairy-tale cliches you ever read, with a heroine I strongly identify with. She is a nerd ffs, thick glasses and all! If it was a movie chance is I would hate it though. But in book form, it totally charmed me. Agatha Christie - Dumb witness, Peril at End House and The Mystery of the Blue Train: A.C. is always a safe option. You know what you get. And I think Poirot is hysterically funny. Todd McCaffrey - Dragonsblood: The son has taken over the reins. I still don't know if I approve. But I must read all things that concern Pern, of course. However, I wanted more about the early days on Pern and he delivered that. I was far gone into that world for several hours. Raymond Feist & Joel Rosenberg - Murder in LaMut: Uh. Nah. Doesn't click. Sorry. Nothing much to say about it. David Gemmell - Hero in the Shadows: Tragic high fantasy. Pretty much as expected, but in the good way. Waylander resurfaces, and we also get more insight into Ustarte, the priestess. P.D. James - Cover Her Face: I bought and read the Lighthouse early in the year, and whoa. A jewel. Cover Her Face is apparently her first novel, and she does get better with the years, but it is far from bad. Marian Keyes - Further Under the Duvet: More chiclit, though in the shape of her journalism. Sharp satire over every day problems like bad hair days, make up addiction, shoe-oholism, not finding anything that looks good on ones round body in the fashion shops, the tediousness of flying, Russians, and more. Most adult females I know should be able to recognize themselves in this, and have some good laughs - and feel happy that other people have similar problems. And most men should be able to smile at recognitions too, either personal or their gf/sister/wife/friend/boss.